Panic was a permanent guest in the Schnitzer's home during the 1920s. They celebrated life, but never in moderation. Thanks to Gerald's grandmother acting as a traffic cop on an emotional oasis, order was restored. Before her death, Grandma Sarah discovered the calming waters off Coney Island. She never learned to swim, not a stroke, but she could float, sometimes out of sight of land - but that's another story. Gerald Schnitzer is the co-author of Blood of the White Bear (WriteLife, 2013), author of My Floating Grandmother (WriteLife, 2011), and a retired film director and screen writer. Gerald was born and raised in Brooklyn and graduated from Dartmouth College in 1940. Following his service in WWII as a 2nd Lieutenant, attached to a French Cadet Air Crew Training Unit, he began his professional career as a writer and director in Hollywood. He retains his membership in Writers Guild of America and Directors Guild of America and continues his writing, publishing short stories in national magazines. Gerald's Polaroid art work was exhibited internationally. He owned and operated Gerald Schnitzer Productions for twenty years and was awarded several Gran Prix for his commercials for Kodak, Chevrolet, and Clairol. Feature film credits: Sail to Glory, The Naked Sea, Doomtown, Kid Dynamite, Bowery Boys, Jinx Money, The Corpse Vanishes, and TV segments of Lassie and National Velvet. He gained notoriety in the world of TV advertising in the late 1950s by his humanizing commercial, creating the so-called "Kodak Moment." i have just finished reading My floating Grandmother written by Gerald Schnitzer.I was so enthralled with the charm and wholesome feeling I felt when i finished reading this delightful book. Is there a sequal please let me know. My Floating Grandmother, Schnitzer's recently published memoir of his early days in Brooklyn, vividly paints a picture of the city as it was in the 1920s. Rather than employing dense narrative prose, Schnitzer offers a series of fascinating vignettes that are both funny and poignant, as Schnitzer takes us from his birth through his bar mitzvah. Collectively, the tales speak not only to the exploits of one man's youth, but also to life in New York during the Roaring Twenties. Throughout his various stories, we come to know the members of Schnitzer's "hysterical family," ranging a grandfather who brews wine in the cellar during Prohibition to a buxom grandmother who makes all the men's heads turn at the beach. She can't swim, but - as the book's title suggests - she can float beautifully on the water for hours at a time. But we also become acquainted with the ethnic diversity in Schnitzer's world, which he sets up by explaining how a turn-of-the-century immigration officer changed his family name from Schnitzerski to the more "American" sounding Schnitzer. From there, we learn how a Jewish kid in Brooklyn deals with everything from the young toughs in his neighborhood to an Irish cop who smashes his BB gun. And then there are of course the places that the young Schnitzer frequents. Thanks to his rich use of description, we can literally feel the summer heat of the city and the sense of relief that comes from journeys to the Catskills, as well as to Coney Island, a place in which Schnitzer invests much narrative power, revisiting its importance as a cultural site through tales of enjoying Nathan's, the amusements, and of course the beach with his ever-floating grandmother. All the while, Schnitzer makes clear allusions to important events like World War I and Lucky Lindy's Spirit of St. Louis, thus anchoring his personal anecdotes into the wider context of the late teens and twenties. As a result, his story is more than just his story: the book opens its arms to anyone interested in American history of the early twentieth century. Schnitzer's memoir will also be of great interest to cinema historians and movie buffs, as it provides a window into the rarely examined worlds of film bookings and theatres of the twenties. Schnitzer's father gets his first job in the biz selling "Red Devil" to exhibitors, a product line of deodorants for movie theatres that quickly grew sophisticated enough to include scents designed to enhance the viewing experience of particular kinds of movies, decades before processes like Smell-O-Vision. But Schnitzer's father had to scout for a new job again after a canister of Red Devil exploded at a burlesque house, burning a saxophonist and a striptease artist. Eventually he found work as a salesman for the Fox Film Corporation, where he had to convince theatre chains to book the studios' latest releases. There he made a great success by literally acting out the plots of entire films in front of hardnosed exhibitors in order to get them to sign on the dotted line. 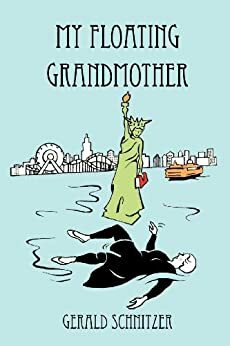 Displaying a wry sense of humor and a keen ability to reconstruct the past in visual terms, My Floating Grandmother deserves to find many audiences, ranging from those interested in Brooklyn history to cineastes who love a good story. Gerald Schnitzer's "My Floating Grandmother" delivers hysterical true stories of growing up in a large Brooklyn household in the 1920's. There is intrigue and unexpected twists every step of the way. Schnitzer's television directorial and story telling talents are everywhere. He paints strong, eloquent, colorful characters who constantly stumble into hilarious situations. You can practically feel the heat coming off the 1920's Brooklyn sidewalks as he takes us on a colorful tour. This is a fast-paced page-turner that will make you laugh your head off. This is a wonderful and rich nostalgic look at early turn of the 20th century life in Brooklyn. The humor that is invoked is a marvelous tool to shed light on the trials and life lessons of three generations of a Jewish family doing it's best to assimilate in a new country, and maintain unity, while the younger generation seeks it's own way. The details of family life during that period are precious, and the funny anecdotes intertwine to make for a most enjoyable read. A hardy recommendation. OMG--This was my childhood. Buy this book if you ever were raised in or near a Jewish family. The author captures the humor and love of that type of family. I really liked the writing and it was an easy and very fun read.